A security alert that resulted in 40 homes being evacuated in Derry's northern suburbs this afternoon has been declared an elaborate hoax. Inspector McDermott said: “We received a report that a device had been left outside an address in the Clon Elagh area of the city, around 10.10 a.m. this morning, Monday, April 15. “Following further examination, it was declared an elaborate hoax and residents have been able to return to their homes." “I would like to thank the local community for their patience in giving us time as we dealt with the incident. 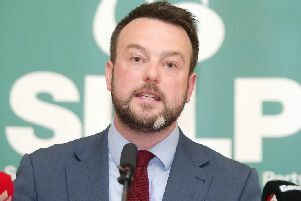 SDLP Councillor Brian Tierney said: “Clon Elagh is one of the relatively new developments in the city. It’s full of young families, trying to make a life for themselves. The last thing anyone here wants or needs is to be forced from their home by another security alert." He added: "We’ve fought for much needed housing like this in our city for years. This kind of throwback undermines the hard work done to secure new housing and get local people housed."